Although the restore and cleanup business is not quite as much a boom thing as it was when Photoshop first came out, it still comes up pretty regularly. Even though detailed restorations take time, there are a few things you can do to get the most obvious problems solved without too much trouble. The most common problems with most older photos have to do with age. 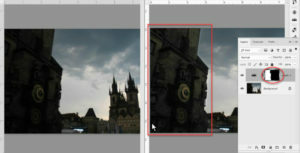 Images yellow or fade with time, in which case doing a restore implies color correction or improving saturation. Others involve fading of contrast, or having areas too light or dark to see detail in. Recognizing the main problem(s) more or less on sight is often the key to the solution. One is correcting the white balance—getting rid of discoloration from time, or sodium lights, or greenish fluorescent light, so the parts that should be white, are white. You can start by adding a Curves adjustment layer and using the White Point sample tool, sometimes known as the White Balance tool. This lets you tell the program what parts of the picture should be white, and has the rest of the picture recolor accordingly. You can also add a Levels adjustment layer, to restore or bring back contrast. If the histogram in it shows blank spaces at either end, move the white and black threshold markers inward till they reach the beginning of the non-blank space, and the image should look less flat. Seth was an excellent teacher. He answered all my questions plus tried to give additional tips combined with real world examples. This was my first time using SkillForge. I will definitely use SkillForge again. Great trainer. She answered all my questions and went above and beyond by showing me a few extra things.